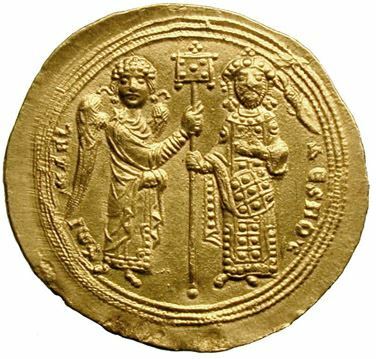 MIchael V was Byzantine emperor for four months in 1041–1042, the nephew and successor of Michael IV and the adoptive son of his wife, the Empress Zoe. Determined to rule on his own, Michael V came into conflict with his uncle John the Orphanotrophos, whom he almost immediately banished to a monastery. Michael now reversed his uncle's decisions, recalling the nobles and courtiers who had been exiled during the previous reign, including the future patriarch Michael Keroularios and the general George Maniakes. Maniakes was promptly sent back to Southern Italy in order to contain the advance of the Normans. On the night of 18 April to 19 April 1042, Michael V banished his adoptive mother and co-ruler Zoe, for plotting to poison him, to the island of Principo. His announcement of the event in the morning led to a popular revolt; the palace was surrounded by a mob demanding Zoe's immediate restoration. The demand was met, and Zoe was brought back, though in a nun's habit. In response, Michael fled to seek safety in the monastery of the Stoudion together with his remaining uncle. Although he had taken monastic vows, Michael was arrested, blinded, and castrated. He died as a monk on 24 August 1042.